a thin layer of cartilage between the epiphysis, a secondary bone-forming center, and the bone shaft. The new bone forms along the plate. Epiphyseal plates remain open until late adolescence. Also called growth plate. emanating from or pertaining to the epiphysis. caused by (1) idiopathic primary necrosis of the epiphysis in growing small-breed dogs (Legg-Calvé-Perthes disease); (2) fracture of the femoral neck; or (3) epiphyseal slippage, particularly of the femoral head in young dogs, cats, pigs, calves and foals. The disease has a characteristic radiographic appearance. between the epiphysis and the diaphysis of long bones; growth at the cartilage is responsible for continuing growth of the bone; when growth ceases the cartilage disappears. Called also growth plate, physis. an inherited defect of dogs characterized by very short limbs and early degenerative arthropathy. Called also chondrodystrophia fetalis and pseudoachondroplastic dysplasia of Miniature poodles. A similar histological lesion occurs in multiple epiphyseal dysplasia in Beagles. one involving the epiphysis. See also salter classification. the thin plate of cartilage between the epiphysis and the shaft of a long bone; it is the site of growth in length and is obliterated by epiphyseal closure. Called also growth plate, physis. on radiographs, the radiodense band seen at the junction of the epiphysis and metaphysis, which represents the closed physis. In the current study, effects of iron supplementation on rats during pregnancy were observed especially on the longitudinal growth of epiphyseal plate of femur. Following approximately two months of conservative care, the diagnosis was revised to include the possibility of a more significant bone or epiphyseal plate injury (Little Leaguer's Shoulder). A UBC tends to have a conical shape, with a wider or "ice cream cone" base paralleling the epiphyseal plate. Chondrocytes replicate at high rate in the proliferation zone of the epiphyseal plate become differentiated in the zone of maturation or hypertrophic zone where they attract growth of the blood vessels and bone forming osteoblasts which ossify the hypertrophic zone cartilage into bone (Nilsson et al. The exact site of origin of GCTB remains controversial, but it is thought that the lesion arises from the metaphyseal side of the epiphyseal plate [1, 4]. Objective: To determine the effect of nicotine and camellia sinensis (green tea) on the developing epiphyseal plate of thigh bone of chick. 3] deficient young ones (Capen, 1985) and epiphyseal plate is thickened owing to an accumulation or excess of non mineralized osteoid tissue in area of bone formation. Wrist joint x-rays show cupping and fraying of the metaphyses and a widened epiphyseal plate. 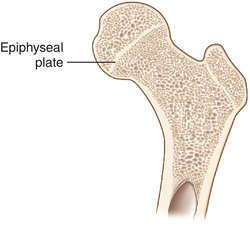 Running through the cancellous bone near the junction of the expanded end with the shaft is a line of dense bone called the epiphyseal scar marking the site of original epiphyseal plate of cartilage. Ten fractures involving the epiphyseal plate were diagnosed during the study period. CONTRAINDICATION: In fracture with vascular impairment proximal to graft site, for the fracture of epiphyseal plate, presence of metabolic and systemic bone disorder and where soft tissue coverage in not possible at graft site.